Our Gospel today (4th Sunday of Advent, Matthew 1: 18-24)) provides us with the story of a young couple, Mary and Joseph, who through their pondering of God’s request for understanding and trust provide humanity with the opportunity for divine Redemption. 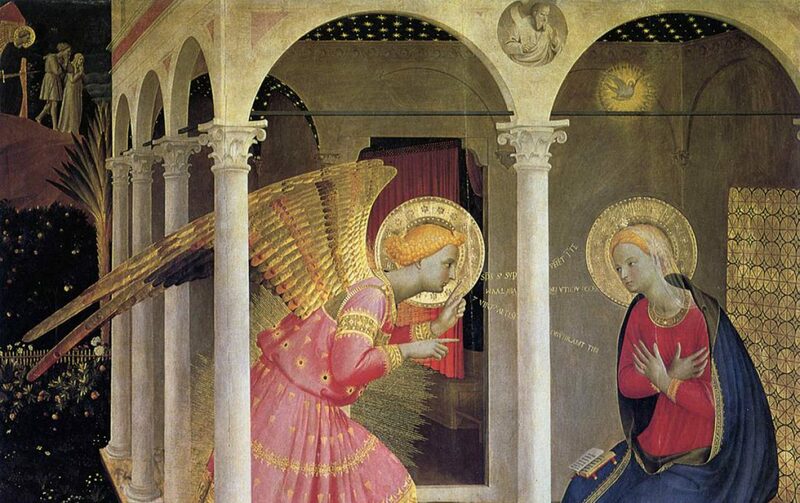 It is in their collective “Yes” to the angel’s request, that God’s plan could be fulfilled. His strategy for humanity’s Redemption was patiently planned and executed. It was a plan, seen in the Holy Scriptures, that shows Him searching for His broken human family, seeking ways in which He can communicate His desire for love and friendship. God is very methodical in His attempts to search for His lost children. The first question ever asked in Holy Scripture is found in the book of Genesis. It is there that God asks the question: “Where are you?” He asks of the first family, Adam and Eve, “Where are you hiding?” We know that they were hiding because of their sin; because of their collective “No” to God’s request of them to stay away from the Tree of Knowledge of Good and Evil. With their sinful actions, God set into motion His plan for our Redemption – a plan that ultimately saw His entrance into human history to teach, heal, and redeem it from the sins of our spiritual parents. At the birth of Christ, the seven hundred year old messianic prophecies of Isaiah became a historic reality; and on a yearly basis, we celebrate that moment at Christmas. But today we also need, in light of our Gospel, to pause and rejoice in remembrance of Mary and Joseph’s courage and willingness to say, “Yes,” to God. We need to consider that their “Yes” was not a simple act – it contained enormous risks since Mary’s circumstances after that “Yes” were at the very least – precarious. She was a young woman, probably in her mid teens, engaged to be married, and is suddenly pregnant, not from the man she loves, but, by an unseen Holy Spirit of God; moreover, what about Joseph? He was a successful carpenter in Nazareth who had fallen deeply in love with Mary, was publicly betrothed and ready to live a happy life with her. Then the news: “I’m pregnant.” As a result under Jewish law, Mary faced a public humiliation and stoning and Joseph, stunned and confused, faced feelings of betrayal, pain, and anger. Understandably, at first, he is not ready to say “yes” to Mary and her story of divine intervention, there are few men that would. “Joseph, Joseph, do not be afraid to take Mary your wife into your home.” With Joseph’s “Yes,” to this request his pain and anger subside and are replaced with a joyful nurturing spirit that enables him to take leadership of the situation and begin acting as a faith-filled stepfather. So the collective “No” by our spiritual parents Adam and Eve, is now trumped by the collective “Yes” of the first Christian family: Mary and Joseph. Now it may be hard for us to relate to this Gospel. Our lives may be filled with anger, worry, family resentments, and disappointments. We may conclude that this story really doesn’t relate to us because the sharp axe of pain and frustration has severed the roots of our own sense of joy, hope, and love. If that is our dilemma, we must call out to God for His direction and try to remember, that in this Christmas season we can, with His help, change our focus. We can say, maybe for the first time with maturity, “Yes” to God and His call to us. You see the story of Mary and Joseph and the Christ child is absolutely relevant. For the angel’s request to Joseph of “Be not afraid” applies to us, too. The request of “Be not afraid” involves many different opportunities: the opportunity of forgiving others who have hurt us; or confronting our own sinfulness and unburdening ourselves of our sins, or the opportunity of being a person who desires to seriously investigate their faith and explore the reasons why we believe. You see all of this involves the same risk that Mary and Joseph experienced: the risk of exposing our mind, heart, and soul to God’s love and allowing Jesus, through His sacramental grace, to be joyfully born into our own hearts and to give us the courage to truly live as a Catholic Christian. So my brothers and sisters, as we make our final preparations for the celebration of Christmas, let us make every effort to imitate Mary and Joseph by saying “Yes” to God’s call, and in so doing, open the doors of our own hearts to provide a loving home for the Lord.